Research shows that our bodies carry and shed an alarming amount of bacteria; our hands alone are estimated to host around 9 million bacteria! With over 4.25 million people employed in the European food and drinks industry, there are a lot of hands involved in the processing of our bodies’ most vital need. As food moves from the table to the farm, the higher the risks and the need for proper safety measures become. The EU has issued several directives and legislations to ensure that food and drink products are not contaminated with substances that are harmful or that affect the quality. Safety guidelines such as Hazard Analysis and Critical Control Points, Good Hygiene Practices and Codex standards are set up to help companies ensure the safety of their products and the hands that deal with them. These include the correct use of PPE gloves. However, the reality is that that many end up using the incorrect glove for the task at hand or even no glove at all. 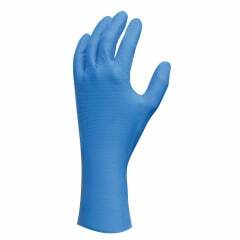 At SHOWA we strive to protect what’s important, which is why we’ve introduced the SHOWA 708: a lightweight and strong nitrile glove specifically designed to combat the risks within the food sector, keeping products safe from contamination and hands safe from harm. The special organic formulation makes 708 safe for contact with all food categories in short term repeated contact situations. The glove is liquid proof and ideal for use with fatty and oily foods. It conforms to the shape of the hand, creating a comfortable second-skin feeling for extended use during precise manual operations. Due to its increased thickness and nitrile properties, the 708 provides exceptional resistance to tears and chemicals. The grip pattern creates a webbing that runs through the glove, reinforcing the strength and durability. The winning combination of exceptional grip, durability and mild material properties makes manual tasks within the food industry using SHOWA 708 comfortable and much safer for both the wearer as well as the product that is being handled. Blue colour allows immediate identification of broken pieces, eliminating any risk of contamination (as per HACCP). Gloves are also packaged in blue food-safe dispenser bags for easy grabbing.